Cory Stalling rides a “buddy bike” with his aunt, Laurie Stalling, on Friday afternoon to meet Mac Sullivan and Drew Gottman, who are riding coast to coast to raise money and awareness for Duchenne muscular dystrophy, a genetic disease that Cory has had his entire life. Gottman, left, and Sullivan, who organized the ride as part of their senior project, have a photograph taken with Cory Stalling after arriving in Missoula on Friday. Gottman and Sullivan will continue their coast-to-coast journey after a brief stay in Missoula. Cory, 11, wore a giant smile on his face as the fifth-grade graduate took photos Friday in Bonner Park with the young gentlemen who are riding across the country to raise $12,000 for the Jett Foundation to help find a cure for Duchenne muscular dystrophy. Mac Sullivan and Drew Gottman are doing the ride as their senior project, and they’re dedicating it to Cory. At the age of 8, Cory was diagnosed with the muscle wasting disease, but Friday, he hopped atop a tandem bicycle with his aunt, Laurie Stalling, to ride along with the transcontinental crew on a short portion of their journey. “It’s cool and fun,” Cory said of the bicycle. “He likes to go through the puddles on it,” Stalling said. But that doesn’t mean he likes being drenched. Rain soaked the riders, and Cory shared his favorite part of the pedaling. “When the rain wasn’t here. I didn’t like the rain hitting my face,” Cory said. Water played a role in one of the most beautiful portions of the trip so far, too. That’s the stretch along the Columbia River Gorge, Sullivan said. “You ride next to a ton of waterfalls, and it’s a really pretty ride,” he said. The Hellgaters and Ty Miller, a Kansas City friend who has ridden for the Jett Foundation before, started their trip in Seaside, Ore., Friday, the trio and friends who joined for part of the journey rolled into Missoula and Bonner Park. Earlier this year, Cory got a canine assistant, a dog and friend named Rita, and at the park, Sullivan showed Cory a “Canine Assistants” ballcap the cyclists are traveling with and having friendly folks sign for the Missoula boy, an avid reader of National Geographic. Cory, a lover of animals and inquiries, pointed to signature after signature and fired off his questions to Sullivan. 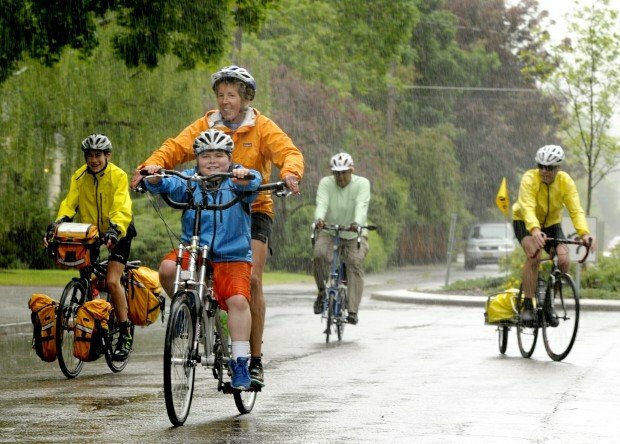 The JettRide runs from Minneapolis, Minn., to Point Pleasant, N.J., and the high schoolers and Miller will ride to Minneapolis and there join other riders for the bike-a-thon. When they reach New York, Cory will join them for a celebration. To keep up with their ride or donate for the cause, go to bikestory4cory.blogspot.com or the “A Bike Story for Cory” page on Facebook. A group of people also will participate in the Missoula Marathon to “Run for Our Sons” and raise money to end Duchenne.